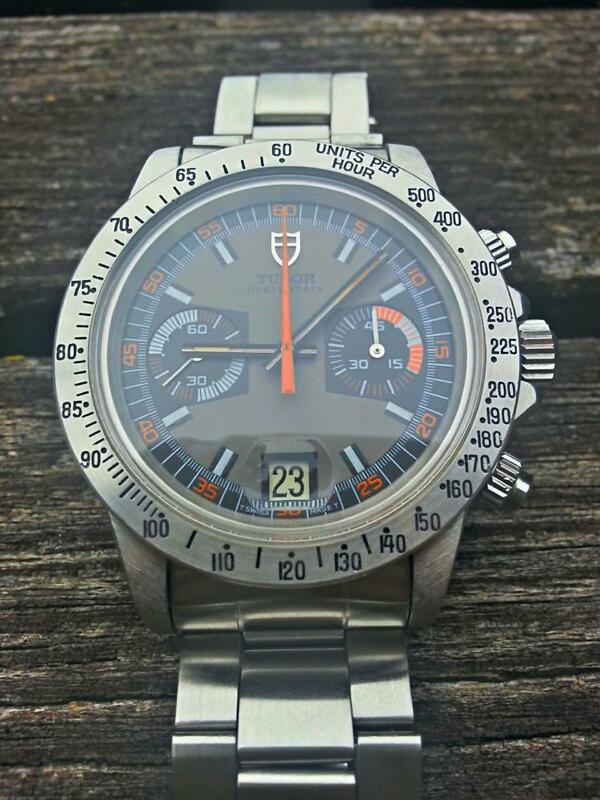 For sale is this Tudor Monte Carlo Reference 7159 from 1974. Comes in it's boxes, inner box and outer box included, however, the pillow is missing. Had a full service In September 2014 and the movement was adjusted and the watch was pressure tested. but no paper to that effect. The watch has previously been polished, but the case remains very strong. No dings or scratches on either the bezel or the case. Caseback is original Rolex as is the Rolex triplock crown. The dial is absolutely flawless and beautiful but the lume is gone. The original hands have been preserved exceptionally well. I would call the bezel absolutely flawless, cannot make out even the smallest fleabite. The paint on the bezel and the condition itself suggests to me,that this part has never been polished. The Rolex 7836 bracelet has very little stretch and comes with its original 380 end links. I am asking US$ 11,500 includes free shipping CONUS FedEx insured shipping outside united state is welcome with additional charges. Returns accepted if the item is not as described within 72hours of receiving the watch and inspection. Buyer must return the watch at the same exact condition it is received.